Dwells Top 7 Meal Planning Tips! Meal planning can be a huge timesaver, stress reliever and money saver if done properly. Here are a few tips to help you in your meal planning adventures. You will be shocked at the amount of time meal planning will free up for you during the week. If you aren’t stressed about meals during the week it can actually bring the joy back into cooking! 1. Seven Nights? Lets be realistic! 3-4 nights a week doing a meal from scratch is realistic. Don’t set expectations and make a meal plan that you can’t stick too. This will only discourage you and get you off track. 2. Start a master recipe list! Make a list of your tried, tested and true recipes. Have it somewhere handy, like your smart phone so when it comes time to meal plan you can be quick and efficient! Try out 1 or 2 new recipes each week and fill the other days in with your staples! Pick one day on the weekend to shop and prep. You can either prep meals in full that reheat well, or partially prep your ingredients to save time during the week. Cooking like this when you are not rushed can actually be quite enjoyable. Throw on your favourite tunes and rock out while you chop! 4. The freezer is your friend! Double up recipes and freeze individual portions. You will thank yourself later for this! Having quick grab and goes are always handy especially for lunches at the office/school. Come lunchtime your home cooked goodness will be partially thawed and just require a quick reheat! Plan meals that utilize similar ingredients. This will help to reduce waste and keep costs down. This is especially important if you live alone or are just 2 people. Look for recipe ideas that allow you to use one days leftovers in the next days meal! (Example, roast a chicken one day and then do chicken fajitas the next day!) This will keep your work efforts down and also help to reduce waste! 7. The classic Leftover Night! This was a thing in my house! Does it still happen? Line up the entire weeks leftovers on the counter and allow everyone to serve themselves buffet style! Everyone ultimately gets what they want and you get a night off from cooking! Does Lemon Water Really Help you Lose Weight? So, we have heard lots about the magic of lemon water… But does it actually promote weight loss? Well, not directly. Slamming a lemon water after your Big Mac isn’t going to do the trick, but there are some huge benefits to fortifying your water with the refreshing citrus! How about replacing your first coffee in the morning or your after dinner latte with a hot water and lemon? This will reduce caloric intake and also staying hydrated is an important part of a healthy diet as it keeps the metabolism humming. Lemon is known to promote digestion, loosening toxins in your digestive tract that can cause indigestion. In the short term, drinking water with lemon can also reduce bloating. It acts as a mild and natural diuretic. And… It doesn’t stop there! Drinking lemon water is actually quite good for your skin as well! The antioxidants in lemon juice help to decrease blemishes and wrinkles (so they say, but it can’t hurt right…?). So all in all, as mentioned early, a glass of lemon water isn’t your magic weapon to weight loss, but I do believe it is one of the simplest and healthiest choices you can make in lifestyle! This is your body … This is your body on texting! So lets be real here. I’d love to say, put down your phone, but we all know that isn’t going to happen anytime soon. The average person sends and receives approximately 50 text messages per day. That is a lot of time in the “text position” and that’s not even including all the other time we spend on our phones. This so called “text position” can be very hard on the body. 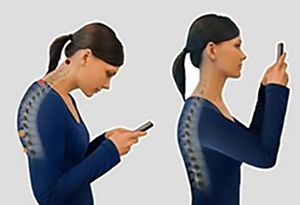 Since we aren’t going to put the phone down, lets discuss the most ergonomic way to ensure we don’t develop related aches and pains, aches and pains that you may not have even realized are a result of your habitual smart phone habits! Texting puts you in a head down position. An average adult head weighs approximately 10-12 pounds. (Thats about the equivalent of a bowling ball). According to studies, holding your head at 60 degrees exerts about 60 pounds of force on the neck and upper back. Solution: Simple.. Raise your phone. Bring it to a level so that your ears are above your shoulders. No more Hunch Back of Notre Dame, no more stiff neck! Alright, so we have gone so far as to adopt the term “texting thumb” for what is more commonly known among the medical world as De Quervain syndrome. De Quervain syndrome is a over use injury affecting 2 muscles that control movement of the thumb. These muscles are the extensor pollicis brevis and abductor pollicis longus. These m uscle tendons can become inflamed causing both pain and also a decrease in grip strength. Solution: When possible, try to use your phones voice recognition. If voice command isn’t ideal be sure incorporate the use of other fingers into your texting pattern. The fine motor demands on our wrist and fingers when using our devices can lead to a very painful condition know as carpel tunnel syndrome. This is an impingement of the median nerve in the wrist due to inflammation of various surrounding muscles and muscle tendon. This is your body on texting! This one is for our runners! Amidst all our pitbulls swinging kettle bells around, we see you gracefully gliding over the treadmill with your gazelle like strides! Well lets talk shoes here, because the number one cause of running injuries is improper footwear. Selecting the right shoe for your foot type and running style is not an easy task. I am going to lay out some guidelines that should make the decision making a little easier. Running shoes basically fall into three categories with varying degrees. These categories are neutral, stability and motion control. There are many features within a shoe that can make it more or less stable but for this article we are going to focus mainly on midfoot stability. First and foremost, before selecting a shoe you need to determine your foot type. Are you an overpronator, a supinator or do you have a relatively neutral foot? I have included some generalized diagrams of the heel bone viewed from the back relative to the bones of the lower leg and images of footprints as well to help you. If you find that you have a pronated foot type (flat foot) you should be looking at motion control shoes. Motion control shoes tend to have a dense plug inserted under the midfoot in the sole of the shoe. This plug gives the shoe aggressive support in the area of the foot that tends to collapse during the stance phase of gait. If you have a pronated foot type, your foot is often quite flexible. To avoid repetitive strain injuries, a motion control shoe will tend to offer the rigidity that your foot is unable to provide. If you have a supinated foot type (high arch) you should typically be looking at neutral and cushioning shoes. A supinated foot tends to be more rigid and does not absorb shock very well. This foot type is prone to injuries resulting from a lack of cushioning, i.e. stress fractures. A neutral shoe tends to have more cushioning properties to counter this. From left to right, motion control, stability and neutral. Notice the grey plug on the sole of the motion control shoe and the similar but lesser plug on the stability and the lack there of on the neutral. This is a way to identify which shoes fall in which categories. If you find yourself fortunate enough to be in the neutral category, recommending a shoe is not as cut and dry. Typically I would suggest a stability shoe. This type of shoe offers similar properties as the motion control shoe but to a lesser degree. Some people with a neutral foot find a neutral shoe that offers little support to be most comfortable. With this foot type you have some flexibility to play around with different shoes within the stability and neutral category and find out what is best for you. I would avoid a strong motion control shoe as you don’t want to over correct the foot. Determining which shoes fall under which category can be difficult to determine. I recommend purchasing your footwear from a knowledgable retailer. Contact us at Dwell Gym in Lesliesville. We’d love for you to join our ever growing family!